Air travel has assumed a new dimension in the modern era. Low cost airlines have made travel affordable. Singapore and Malaysia are two countries connected to rest of the world by budget airlines. Singapore like Malaysia is a destination which offers the visitors more value for their money. Singapore is not a cheap destination like Malaysia, but flying in a lot cost airline can make a huge difference in the holiday budget. With an area much less than that of Trivandrum district, Singapore is a pretty small country. Tourism Industry in Singapore has grown tremendously thanks to relentless pursuit for excellence in public and private ventures. Corruption is almost zero and citizens get excellent response to their grievances through a technology based interface. The public transports systems like buses and the Mass Rapid Transit are often known as MRT are too good. The standard of living is very high thanks to a vibrant and flourishing economy. Man made attractions are the core to the Singapore experience with a competent of beaches complimenting it. When the tiger airways flight from Trivandrum landed at the Changi International Airport there was an excursion in the air and Singapore did not disappoint us. From the point of touch down to the departure point, each moment was enthralling. The first thing that stuck us was the cleanliness and sophistication that was prevalent in the city. The budget was in our minds as our hosts had asked us hire a taxi other than the Chrysler as it would dent our pockets badly. The driver, who spoke excellent English, was quick to assure us that this was only a normal taxi. But from the Indian point of view this was a luxurious cab. The sights unfolded one by one as we proceeded to our place of stay, the Pinnacle at Duxton, a fifty story flat complex in the Cantonment road. This huge structure truly reflected the Singapore style of living as 85% of population lived in flats. My friend Sasi, regional manager in a multinational and family were there to greet us. Their flat which was in 46th floor was our place of rest for next five days. The view from the living from was stunning. Skyscrapers dotted the horizon and the port quite visible. The smooth flowing traffic was a sight to behold compared to the chaotic scenes that were familiar in Indian roads. My wife was pretty tired and preferred to rest while I stall out the building to get a first hand experience of Singapore. Armed with my camera, I felt like taking pictures of everything at sight. Driving is in the blood and I longed to get behind the wheels of any cars which whizzed past. Another thing which stuck me was the rights which pedestrians enjoyed while crossing roads. Crossing a busy street back home is a nightmare while here vehicles stopped at zebra crossings when someone wanted to get to other side. I was pleasantly surprised as I hesitantly stood at crossing when vehicles stopped and the driver of the bus smilingly motioned me to cross. At that moment I felt like a king when the entire traffic stopped at its heels. Pedestrians also enjoyed the privilege of pressing a button at the crossing which stopped all traffic and allowed them to cross. I initially thought that all the cars were petrol driven as we could not see any vehicle emitting smoke from its rear. But I was in for a surprise when told that most of the cars were diesel driven. India can take a leaf out this system when it comes to combating vehicular pollution. Cars which were more than ten years are not allowed. So all the vehicles had new look. The buses which ply the roads were fully air-conditioned and operated both on card based payment via card readers and by payment in cash to the driver. This card system was blessing for us as we could move about on our own. MRT is the metro rail service which also could have been used using these cards. MRT is convenient and quick way to travel in Singapore at minimum cost. The public transport system here is so good that almost all people use this as a mode of transport thus reducing traffic congestion. The commuters and people here are mostly Chinese who are seventy percent of the population. Working while traveling is common here thanks to state of art mobile devices for which Singapore is famous. After having lunch, we departed to the boarding point of the duck tour, a popular tour package. The mode of transport is an amphibian vehicle which runs on land as well as water. Our guide, who spoke excellent English, cave us lots of information about the landmarks and building on either side of the road. We proceeded to an army area, where we saw some armored vehicles resembling the one which were riding. They were kept as exhibits to remember the heroes of war. Soon the guide announced that we are entering the Marina bay and the journey was now through water. From this point onwards it was like a boat ride. Awesome structures lining the bay were a sight to behold. The Marina Bay Sands, Science Museum and the Merlion were the sights that were fest to the eyes. After circling the bay the vehicle once again become a land driven one as we took the roads. Next stop was the Singapore flyer which is essentially a huge wheel offering a bird's-eye view of the city and its surroundings. The cabins of the flyer are of reinforced steel and glass offering a 360 degree view of the city. One revolution of the flyer takes about thirty minutes and it rotates in clockwise direction. Earlier it rotated in the counter clock wise direction. This was later reversed on the advice of Feng Shui masters. We returned to our flat by 10 pm by MRT without much trouble. One amazing thing which I noticed was the precise timing adhered to the public transport system be it MRT or the buses. The bus stops and MRT stations had displays which showed timings and route maps. We could find out the bus numbers and timings from Internet and to our pleasant surprise found the system adhering the timings perfectly. The Indian counterparts will benefit if they take a cue from this. 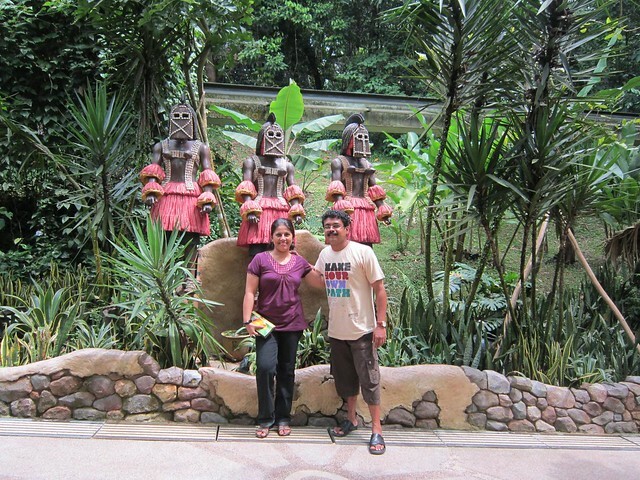 The next day we scheduled our visit to the Sentosa Island. The ticket covered some attractions and the cable car ride to and fro. The cable car experience was simply out of the world. My wife was initially apprehensive to look down, but the fear gave way to excitment as we fell into the groove. The attractions in Sentosa are many and depend on your budget. We chose four experiences. The first was 4D show which is similar to those in theme parks like the Wonderla back home. Our next stop was the Merlion which is mythological symbol of Singapore. With a lion's head and body that of fish, this structure is about 37 meters tall. Visitors can climb up to the mouth and enjoy a panoramic view of Sentosa. The monorail transport system and buses allow visitors to move around this Island. We boarded the monorail to the underwater world, an aquarium, housed in a tunnel shaped glass chamber through which the visitors can walk or stand on a moving conveyor belt. The marine life present here ranges from killer sharks to huge ray fishes. Under water divers equipped with cleaning devices could be seen cleaning up the aquarium. The beaches of Sentosa are very clean and relaxing. The main beaches are Siloso, Palawan and Tanjong. The Dolphin show is something that can not be missed. The acrobatics of the dolphins and an endearing seal with its antics added spice to the show. The last attraction in Sentosa which we saw was the 'songs of sea' which is a mesmerizing show with a live cast, dramatic effects and pyrotechnics. Water jets, flame bursts, lasers and captivating music make this a one of a kind entertainment spectacle. We returned to the exit point by cable car and this time the ride gave us another experience. The view of Sentosa and its surroundings by night was exhilarating. Our destination for the third day was the Jurong bird park. The park is famous for the wide variety of birds ranging from penguins to parakeets. We were lucky enough to catch up with two bird shows namely 'Birds n Buddies' and 'Kings of the skies'. These shows are truly mesmerizing with the birds doing amazing feats. My wife who was very exhausted preferred to rest, while I went about in the park with my legs barely carrying. We returned home by bus to Harbor Front and then took MRT to Outram Park from were flat was a stone's throw away. Later we had dinner with our hosts at Annalekshmi, a restaurant run by a charitable trust. The dinner was really a South Indian buffet. Here bills are not issued and customer can pay according to his conscience. The volunteers are Indians from the upper rungs of the community. On the fourth day we went to little India and true to the name, it had the look and feel of an Indian street. Here Tamil is an official language and population from India is predominately Tamils. There is a famous shopping mall called 'Mustafa' which sells all kinds of items ranging from pain balms to hi-fi electronic goods. We bought a music system, though not cheap but with all features we looked for in a single piece. They also give reduction on producing the passport. Our next destination was the Orchard road. This place houses lots of Chinese shops andalls with items ranging from body sprays to souvenirs. Pathways for strolling are present and traffic is not permitted. Lot of people both tourists and natives contributed to the crowd. We did some window shopping, bought perfumes, souvenirs and enjoyed some Chinese cuisine. This was different from what is given in Indian restaurants back home as Chinese cuisine. Original Chinese food do not use spices as in India. Our friends had planned our itinerary such perfection that we had enough time to go to the blamed night safari. We checked the timings for the bus and boarded it at round 7 pm. By the time we reached the night safari, it was 7.30 pm. The queue was pretty long and it took about one hour to board the tram to see the animals. There was commentary which prompted the visitors about the various animals on either side of the path. Animals ranged from the Malaysian tiger to the African species like the giraffe and Zebra. Tapir, Elephants, wolves etc were among the animals shown. After the Safari, there was a breathtaking fire show by a group of youngsters. We returned by cab and MRT to the flat by 11.30 pm. The fifth and last day dawned and we realized that it was time to leave Singapore and its magic. This was truly a modern age paradise. This day we rested till noon and departed to the IKEA. IKEA is a privately held, international home products company that designs and sells ready to assemble furniture such as beds and desks, appliances and home accessories. It has its origins in Sweden. We spend hours looking at various items and purchased a few for our use. Lamp shades from IKEA is much thought after. We unfortunately were heavily loaded and hence could not buy any. IKEA is planning to set up shop in India and I am sure will find a lot of customers. Since our train to Kualalumpur was at 11.30 pm, we returned to our flat by 6 pm. After packing up it was time to bid adieu to our wonderful hosts. We departed by a taxi at around 8.30 pm to Woodlands railway station. At about 11 pm we boarded the train no. 24 after clearing the immigration checks and took to bed. The journey was comfortable and relaxing. After a good night's sleep we reached Kualalumpur otherwise known as KL by 8.30 am the next day, two hours behind schedule. The driver arranged by the tour agent was waiting for us in station and after a bit of confusion we managed to find him. Our next stop was Genting, a hill station about 55 kilometers from KL. On the way we stopped at the Batu caves, which have a huge record of lord Muruga at the entrance. The temple is inside an intense cave in the typical South Indian style. The cave has many temples with lord Muruga as the chief deity. One has to climb about 272 steps to reach the top. There are three main caves and few smaller ones. The top of the main cave is open and the sky could be seen from inside. Kulalumpur is a city which is mixture of old and new. Malaysia has a multi ethnic and multi cultural background and the official religion is Islam. We had breakfast from a South Indian restaurant located at the entrance to the caves. The food tasted very much 'madrasi' and was very cheap compared to that of Singapore. Our next destination was Genting. The journey by cab was to Genting by cab was pretty enjoyable with traffic thinning down. The atmosphere become cooler as we approached reached the foothills. Our cab stopped at a point from which the cable car ride started. Our luggage, the driver said would go to the top point in the cab. The ride was above the thick canopy of the forests in the hills and lasted for twenty minutes. The scenic beauty of the top was breath-taking. The landing point is just outside the lobby of the largest hotel in the world actually the First World Hotel with boasts of more than 6000 rooms. The check-in process itself is an experience. We had to show the booking details at a counter and by 12 pm the check in and check out time, our token number flashed on the screen. The reception itself is a sight to behold which is about 400 meters long. We were given a room which could have opened using the card given. The hotel is so large that it was quite easy to lose way. After a few hiccups we finally found our room. After a brief rest, we proceeded to enjoy the various shows andalls in the hotel. The experience was awesome with brilliant lighting and colorful exuberance emanating from all over. First World Plaza adjoining the hotel boasts 500,000 sq feet of indoor theme park. The outdoor park is also quite large with some nerve-wracking as well as gentle rides. Parents with kids in tow from various countries could be seen in both these parks. We walked around enjoying the scenes as well a 4D show which was fantastic. Each walk around offered a new experience. The prices of items were a bit on the higher end compared to KL. We checked out from the hotel the next day around 11.30 am after a sumptuous breakfast which was part of the package. The food ranged from Chinese and Indian to European. Our cab driver arrived at the right time and drve us straight to KL for a city tour. The climate in Genting is ever-changing with clouds engulfing the place one minute and clearing off in the next. One more person hailing from Chennai joined us during the tour. The places we visited included the King's Palace, Independence Square, National Monument, National Mosque, Twin Tower, National Museum, Parliament House, Lake Garden and the Selangor Pewter. We also stopped at local shopping centers to buy some local items. This experience was quite different from that of Singapore where we traveled on our own. By 4 pm we checked in our hotel Chow Kit in the heart of KL. After a brief rest, set out on our own again the explore KL by foot. There were many show rooms for ready-made dress items which are cheap and come in a few varieties. Also supermarkets were present which offered all kinds of items. We explored the local vegetable markets which was open even a 12 in the night. I had a taste of the Putt bamboo a miniature of 'Puttu', the delicacy of Kerala. The person who served us this could not believe when I told him that in Kerala we mixed it with banana before eating. The next day and our last in Malaysia was a rainy one. Our driver drve as straight to the Kualalumpur International Airport, Low Cost Carrier Terminal from the hotel. The driver offered us a choice of going to Putrajaya about 25 km from KL by taking a deviation. But we decided against it since we had to check in at the airport by 12 pm. This city houses a number of administrative buildings of Malaysian Government. Finally we bid goodbye to Malaysia and boarded the Air Asia flight to Kochi. We spend 5 days and 4 nights in Singapore followed by 3 days and 2 nights in Malaysia. Cost wise these destinations are ideal for Indian tourists eyeing a great holiday. The memories which we carried, I am sure will linger for years to come.